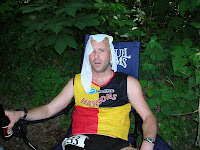 I wound up taking the day off on Friday and headed to OH with Dave to support him in his attempt at running 100 miles! On trails! The temperature for the weekend is going to be hot with a chance of rain on Sunday so that means some humidity will be heading in sometime during the race early Sunday morning. Ahh, the race? A glorious run with 150 or so other nuts through a heavily wooded area with about 110' of elevation change average over the 100 miles. You get 30 hours to complete it. I ask myself who in their right mind would want to be out there for longer than 30 hours. On the way in to Loudonville we drove through several beer stores. Yes... drove. I'm not sure if Dave was really on a quest to fine Coors (just regular not light) or if it was the thrill of just driving through them. We never did find the Coors. After checking in at our hill top hotel room with the very dangerously steep drive we got Dave checked in for the big run in the morning, had pasta dinner, and listened with quickening deafening ears as several people running this thing went on and on and on and on during the pre-race meeting. Dave tucked himself in early while I reviewed the maps for tomorrows journey. 3:30 AM: Get up. OMG it's early! 5:00 AM the runners are off! 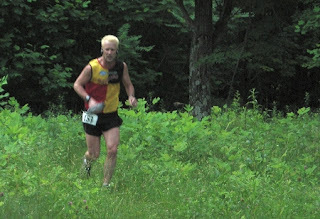 Quick recap not to bore the crap out of anyone, but Dave led the race through 40 miles. Unfortunately he was suffering from very sore feet. He said his PF (plantar faciatis) was bothering him and his inserts were slipping all over the place due to having wet shoes on the technical trails. He also pointed out the 5 toe nails he was certain he'd be losing. Yuk. We got him some cool water for his feet, a beer, and new shoes and almost forced him to at least finish 50 of the 100 miles to get the medal. He appeared at mile 52.something and declared he was done. Of course Mark and Lance had just arrived to run with Dave from the 60 mile mark in but instead ran together that next leg then we picked them up. Even though he didn't actually finish the 100 miles, he ran a good race for the time he was out there.